EPC Group has been involved in a wide range of Amazon Web Services (AWS) initiatives. Our Hybrid Cloud Advisory practice can guide your organization’s AWS initiative from planning and procurement to configuration, implementation and migration. EPC Group provides our clients with seamless integration and deployments and deep knowledge of the AWS infrastructure services that allow customers to run Microsoft Windows Server applications and preconfigured virtual machines (VMs). EPC Group can assist you in not only developing and hosting custom .NET applications within the AWS infrastructure but also provide expertise around enterprise deployments of SharePoint 2019, Exchange and SQL Server 2014/2016. 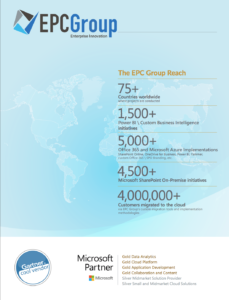 EPC Group also works closely with you to review your procurement quotations from AWS and provides you with licensing strategies around AWS’s Microsoft license mobility through software assurance, which can allow you to utilize your organization’s own Microsoft Server licensing within AWS without additional licensing fees.